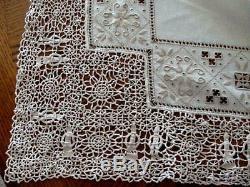 Outstanding Antique Italian Figural Lace & Linen Tablecloth 110. 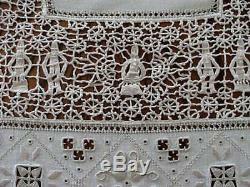 Hand Embroidered Richelieu Cutwork Figural Needlelace. Pristine Condition Laundered & Pressed. 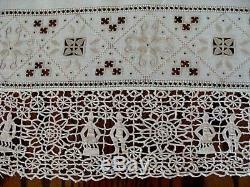 Natural, unbleached ivory linen embellished with AMAZING Italian hand work... Extensive Heavy Italian hand embroidery, Richelieu cutwork, Reticella Needlelace and hand made figural lace. Accented with fancy drawnwork and an extensive hand finished eyelets. 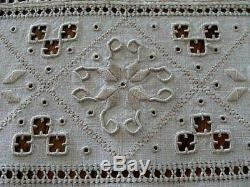 The ornate center section measures 27 1/2" x 68". 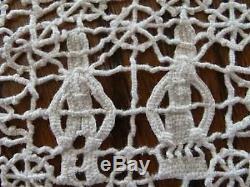 The handwork is expert and extensive. 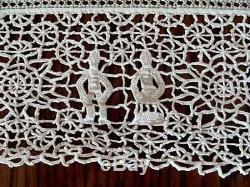 This was made by a very skilled needleworker. Truly of heirloom quality, entirely hand made and made to last generations. This item arrives freshly hand laundered, pressed and ready to display, saving you the time, trouble and expense. 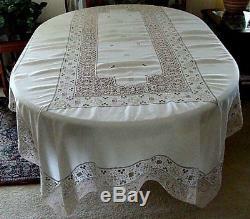 SIZE : Large Banquet tablecloth measures 62 1/2" x 110". 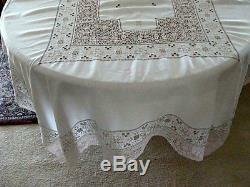 Shown on an oval table, the tablecloth is oblong or rectangular in shape. 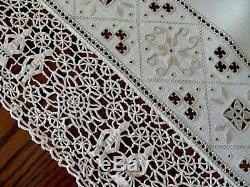 Check our other auctions and our STORE for LOTS more gorgeous vintage & antique linens and lace. CONDITION : is EXCELLENT with NO signs of use/wear. 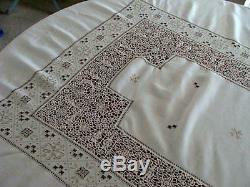 No holes, tears, weak/worn areas, mends, stains, etc. PRISTINE hand laundered and pressed to perfection. Crisp & Clean and ready to use or proudly present as a gift. This arrives wrapped in ACID FREE TISSUE PAPER to preserve the vintage fibers for future storage. Txzj pxzj198 txzj-11 txzj71 txzj115. 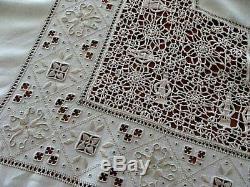 The item "OUTSTANDING Antique Italian FIGURAL Lace Linen BANQUET Tablecloth 110 PRISTINE" is in sale since Tuesday, April 3, 2018. 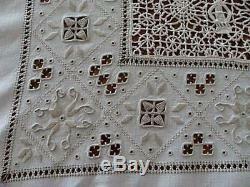 This item is in the category "Antiques\Linens & Textiles (Pre-1930)\Kitchen & Table Linens\Tablecloths". The seller is "shopfromyourseat" and is located in Orlando, Florida.